IMPORTANT - The Amazon.com current price may be lower than our price. Please check out this link (will open in a separate window) and do not hesitate to order here if you wish. 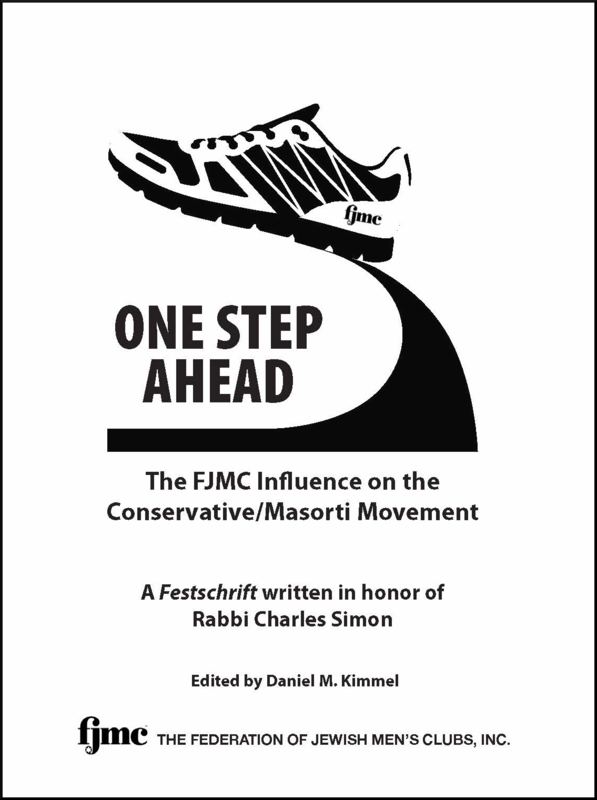 ONE STEP AHEAD examines how the Federation of Jewish Men’s Clubs has had a profound impact on the Conservative/Masorti movement. Essays describe initiatives created during Rabbi Simon’s tenure as executive director including from Jewish education, home commemoration, religious observance, responding to changing demographics, and the evolving role of Jewish men in Jewish life. If you’re not in the rarefied world of academia you have probably never heard of a Festschrift. Developed in Germany in the early 20th century, it was brought over to the United States by scholarly refugees and became a custom here without losing its original name. Essentially it is a volume like this one, a collection of essays honoring a scholar upon reaching a milestone such as – in the case of Rabbi Charles Simon – his retirement after 35 years as executive director of the Federation of Jewish Men’s Clubs. What it is not is a “tribute book,” where friends wish him luck, send him love, and otherwise focus on the person being honored. … this volume, is a celebration of the numerous initiatives that the FJMC has undertaken during his tenure. When one considers the relative size of our organization compared to the branches of Conservative Judaism, it’s quite amazing how often the FJMC has initiated or changed the conversation in our movement. In the coming pages you will encounter the histories of these various initiatives as well as comments and quotes “from the record” that illustrate, in various ways, the impact they have had. Contributors of essays include: Dr. Rela Mintz Geffen, Rabbi Dr. Bradley Shavit Artson, Dr. Burton L. Fischman, Stan Greenspan, Rabbi Charles Simon, Daniel M. Kimmel, Dr. Ron Wolfson, Eric Weis, Harvey Braunstein, Norm Kurtz, Dr. Robert E. Braitman, Richard Skolnik, Rabbi Seymour Rosenbloom, and Dr. Paul Davidson.